The dogs live in squalid conditions. 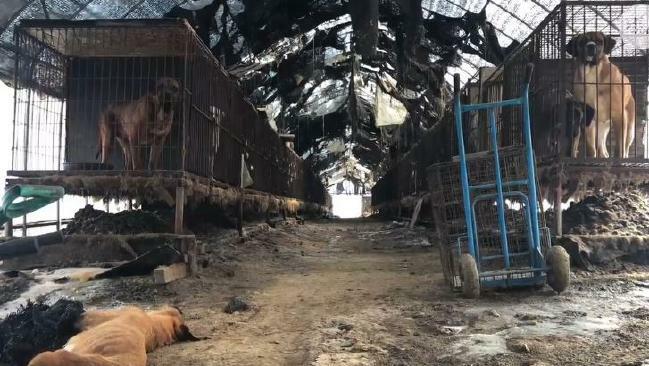 JUST miles away from the centre of the PyeongChang Winter Games, hundreds of dogs, including St. Bernards and golden Labradors, await their fate in one of South Korea's dog meat farms, where they're kept in squalid cages until they're slaughtered for food. Two reporters for USA Today visited one such farm in Wonju - roughly 40km west of the Olympic village - and found an assault on the senses, complete with the sound of "pitiful whines and yelps" from about 300 dogs destined to be dog stew or dog hot pot. An overwhelming stench also emanated from two long rows of elevated cages, where excrement collected beneath in sickening, unsanitary mounds. "Turn it off, otherwise I'm going to throw it down," a man shouted in Korean as the reporters approached on Saturday with cameras and iPhones. The dogs live in squalid conditions. Source: USA Today. 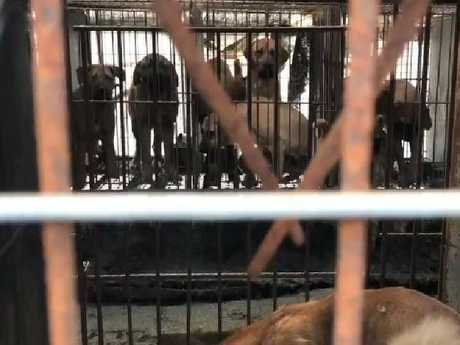 Roughly two million dogs each year are raised on Korean dog meat farms, where conditions are typically poor and animals may be kept without food or water. While the custom of eating dog meat has dated back thousands of years, the country has begun moving away from consumption as more people have moved toward owning dogs or cats as pets. Some major dog meat suppliers have shuttered, but the industry still thrives. 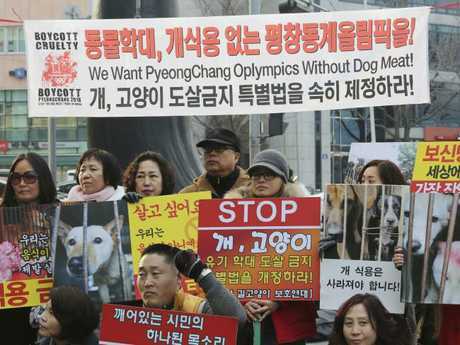 And organising officials in PyeongChang were apparently aware of the likely international condemnation of the practice, since they paid nearby restaurants to remove signs advertising dog meat and requesting that it be banished from the menu, at least until the Games are done. 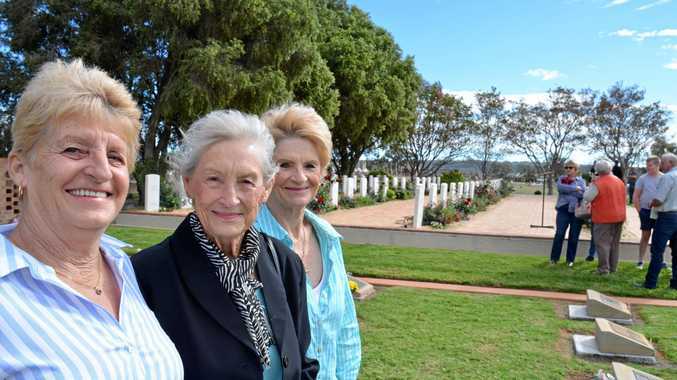 But that wasn't the case, USA Today found, as three restaurants were openly selling dog products just 3km from the $AUD20 million Jinbu Station, which opened in December. Horrifying scenes shocked reporters. Source: USA Today. "They had amended their frontage signs to remove the word 'bosintang' (dog meat stew) and promote goat meat instead, but that was only outside," the reporters wrote. 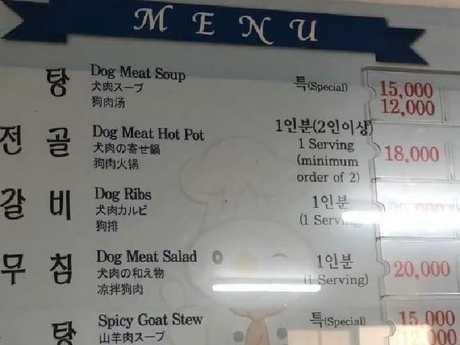 "Walk inside and glance up at the giant white board and the first four menu items, in English and Korean, are derived from man's best friend." Some restaurant owners said they declined to change their menus and take government aid because they were worried they'd be left without their regular customers once the Olympic crowds have left South Korea. "I have been selling dog meat for decades," Park Young-ae, 60, whose Young Hoon Restaurant is near the Olympic Stadium, told the Associated Press. "It is really difficult for me to change my menu just because of the Olympics." Park Young-ae arranges dog meats at her restaurant. The industry persists in large part because many older Koreans believe eating dog meat aids virility, although younger Koreans are typically against the custom or find themselves indifferent to it. But two high-profile adoptions of dogs destined for the dinner table - one by Olympic figure skater Meagan Duhamel of Canada and another by President Moon Jae-in after winning last year's presidential election - have activists hoping the practice is headed toward extinction. "If the Korean people stop eating dog meat, there will not be the market for it," Kim Jun-Won, president of the Dasom animal rights organisation, told USA Today. "But this is wrong and it breaks my heart. The people who keep animals this way and kill them? They are the devil." A sign inside a restaurant shows dog meat is clearly still on the menu. Source: USA Today. 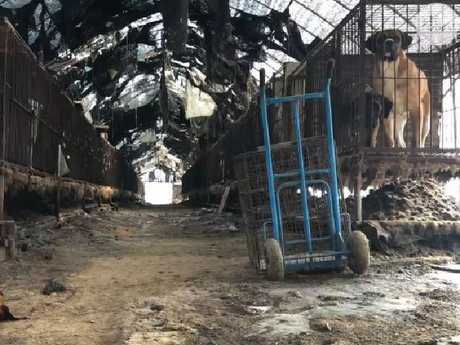 The reporters also visited two other nearby dog farms that showed signs of recent activity, but both were closed, although piles of dried faeces and bones of deceased dogs were clearly visible. "The problem is that while smaller facilities close due to lack of business, larger, better organised ones are popping up," Kiana Kang, director of programs and special projects of American non-profit rescue organisation Animal Hope and Wellness, told USA Today. "This is the two Koreas. There is the beauty and the culture, and then there is this." Animal right activists stage a campaign opposing South Korea’s culture of eating dog meat in Seoul just before the Olympics.